Bryce Harper of the Washington Nationals jogs past Mike Trout of the Los Angeles Angels of Anaheim during the Angels’ win Monday at Nationals Park in Washington, D.C.
Few youngsters arrived in the majors with as much buildup as Harper, who graced the cover of Sports Illustrated at age 16. Luckily for the Nationals, he’s mostly been as good as advertised (and he’s still just 21 years old, a fact that’s often forgotten because he’s been so good). Meanwhile, all Trout did in his first full pair of major-league seasons was turn in two of the 150 or so best position-player seasons in the past 113 years of baseball, making two strong MVP bids in the process. So, yeah, these guys have been really good, really early in their careers. The majority of those 28.2 combined WAR belong to Trout, author of the aforementioned pair of historically dominant campaigns. 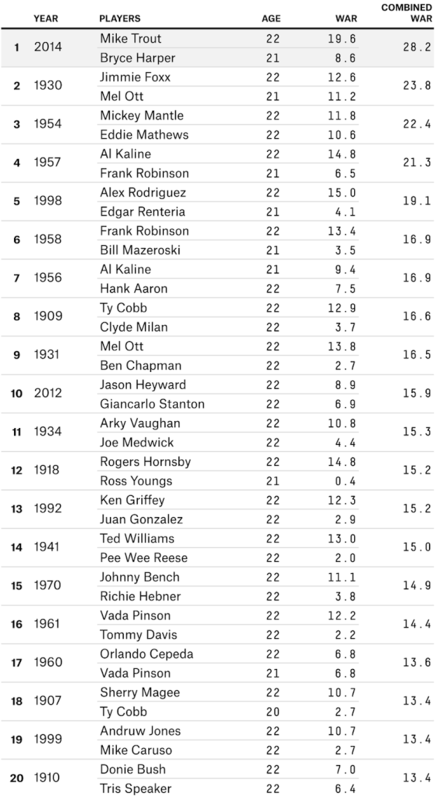 Let’s be honest, though: Given Trout’s otherworldly production at such a young age, we could pair him with just about anybody and he’d still be near the top of this list (Trout by himself would rank fifth). But Harper’s numbers to date hardly make him a coattail-rider. As far as No. 2s go, Harper’s 8.6 WAR ranks below only Mel Ott and Eddie Mathews as the third-best second fiddle in the history of promising under-22 duos. 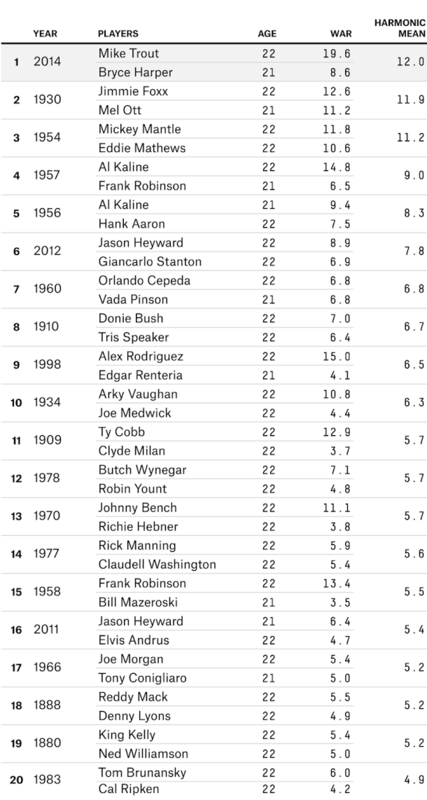 By either list, though, Trout-Harper is the best young duo in baseball history. So, savor their matchup this week — you may never again see a pair of position players so good face off at such a young age.